Located about 7 miles north from Maumee Bay State Park's shores, the 4 story Toledo Harbor Lighthouse marks the entrance to the Toledo Shipping Channel where Lake Erie and Maumee Bay meet. Toledo Harbor Lighthouse is still an active aid to navigation, as many commercial ships continue to pass through the channel. The federal government maintains ownership of the site, and it is not open to the public. Sometime during the late 1990s the beacon's original Fresnel lens was removed and in its place is a 300 mm lens, fed by solar cells. Twice a year, U. S. Coast Guardsmen visit the lighthouse to clean and service the lens, solar panel and backup batteries. The 4000 square foot lighthouse was first operated under the U.S. Lighthouse Service with living quarters for the chief, assistant keeper and their families. The basement had seven rooms including a commissary, general store, furnace etc. The Coast Guard now maintains the Toledo Light. In 1897 the Toledo shipping channel was dredged wider and deeper to allow increased shipping to the Port of Toledo located in the Maumee River, furthering the need for a new lighthouse. The Army Corps of Engineers designed the Toledo Harbor Lighthouse and construction began in 1901. A 20' deep stone crib is at the base of the Toledo Harbor Lighthouse. The Toledo Lighthouse is four stories high with a steel frame and an attached one-story fog signal annex building. The Lighthouse has Romanesque arches and buff brick. Its original cost was $152,000. The total height is 85'. First illuminated May 23, 1904, the 3½ order Fennel lens featured a 180-degree bulls eye, two smaller 60-degree bulls eyes and a ruby red half cylinder glass made in Paris, France by Barbier and Bernard. A weighted clockwork mechanism made the light rotate. The original Fennel lens could be seen from up to 24 miles. In 1966 the light was automated and Coast Guard keepers no longer man the lighthouse. To help prevent vandalism, a mannequin dressed as a Coast Guard officer was placed in the window. For a while another mannequin was added, but over the years only 1 remains. The remaining mannequin has a blond wig and is fondly known as Sarah. Thanks to the mannequin's appearance and disappearance, a few ghost stories have become associated with the structure. In 1985 the light was removed and replaced with a smaller, more efficient lens. 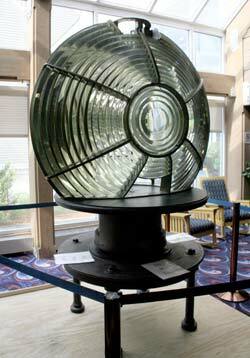 In May, 2008 the 1904 fresnel lens was moved to the reception area at Maumee Bay State Park Lodge, just about 5 miles from where it was originally installed. Locating the lens at the State Park Lodge allows visitors to see up close the size and quality of craftsmanship that went into the manufacture of this important piece of Lake Erie history. The lens was last seen at Toledo's COSI exhibit hall that has since closed.